The epicranial aponeurosis is a thin, tendinous structure that provides an insertion site for the occipitofrontalis muscle. Posterolaterally, the epicranial aponeurosis attachment extends from the superior nuchal line to the superior temporal line. Laterally, the epicranial aponeurosis continues as the temporal fascia. Anteriorly, the subaponeurotic space extends to the upper eyelids due to the lack of a bony insertion. This loose areolar tissue provides a potential subaponeurotic space that allows fluids and blood to pass from the scalp to the upper eyelids. Areolar tissue loosely connects the epicranial aponeurosis to the pericranium and allows the superficial 3 layers of the scalp to move over the pericranium. Scalp flaps are elevated along a relatively avascular plane in craniofacial and neurosurgical procedures. However, certain emissary veins traverse this layer, which connects the scalp veins to the diploic veins and intracranial venous sinuses. The pericranium is the periosteum of the skull bones. Along the suture lines, the pericranium becomes continuous with the endosteum. A subperiosteal hematoma, therefore, forms in the shape of the skull bones. The occipitofrontalis muscle consists of 2 occipital bellies and 2 frontal bellies. The occipital bellies arise from the superior nuchal lines on the occipital bone. The frontal bellies originate from the skin and superficial fascia of the upper eyelids. The occipital and frontal bellies insert into the epicranial aponeurosis. Each occipital belly is innervated by the posterior auricular branch of the facial nerve, and each frontal belly is innervated by the frontal branch of the facial nerve. The frontal bellies can raise the eyebrows. The frontal branch of the facial nerve supplies the frontal bellies of the occipitofrontalis muscle, and the auricular branch of the facial nerve supplies the occipital bellies of the muscle. 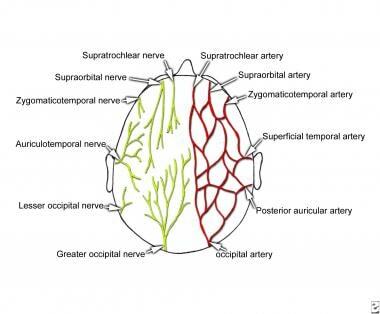 The supratrochlear and supraorbital arteries are 2 branches of the ophthalmic artery, which, in turn, is a branch of the internal carotid artery. These arteries accompany the corresponding nerves. The superficial temporal artery is a terminal branch of the external carotid artery that ascends in front of the auricle. This artery, which supplies the scalp over the temporal region, travels with the auriculotemporal nerve and divides into anterior and posterior branches. The posterior auricular artery is a branch of the external carotid artery that ascends posterior to the auricle. The occipital artery is a branch of the external carotid artery; it is accompanied by the greater occipital nerve. The part of the scalp that is anterior to the auricles is drained to the parotid, submandibular, and deep cervical lymph nodes. The posterior part of the scalp is drained to the posterior auricular (mastoid) and occipital lymph nodes. Wounds in the scalp bleed profusely, because the fibrous fascia prevents vasoconstriction. However, wounds superficial to the aponeurosis gap much less than do wounds that cut through it, because aponeurosis holds the skin tight. During a difficult birth, bleeding may occur between the neonate's pericranium and calvaria, usually over 1 parietal bone, because of a rupture of multiple minute periosteal arteries. The resulting collection of blood several hours after birth is known as cephalohematoma. 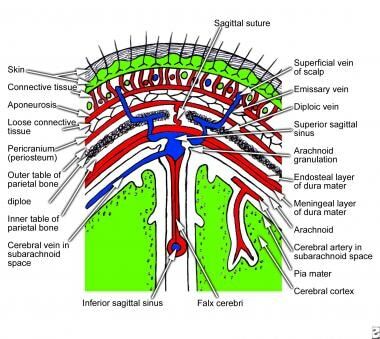 The emissary veins do not have valves and open in the loose areolar tissue; therefore, infection can be transmitted from the scalp to the cranial cavity. The layer of loose areolar tissue is known as the dangerous area of the scalp. Metastatic spread of malignant lesions in front of the auricle is to the parotid and cervical groups of lymph nodes. The posterior part of the scalp is drained to the occipital and posterior auricular groups of lymph nodes. Anastomosis exists at the medial angle of the eye, between the facial branch of the external carotid artery and the cutaneous branch of the internal carotid artery. During old age, if the internal carotid artery undergoes atherosclerotic changes, the intracranial structures can receive blood from the connection of the facial artery to the dorsal nasal branch of the ophthalmic artery. Because it contains numerous sebaceous glands, the scalp is one of the most common sites for sebaceous cysts. Agur AMR, Lee, MJ, Grant, JC. Grant's Atlas of Anatomy. 9th ed. Baltimore, Md: Lippincott Williams & Wilkins; 1991. 464. Chaurasia BD. Human Anatomy. New Delhi, India: CBS Publishers & Distributors; 1996. 37-39. McMinn NH, Hutchings RT, Logan BM. Color Atlas of Head and Neck Anatomy. 2nd ed. Baltimore, Md: Mosby-Wolfe; 1995. 161-3. Snell RS. Clinical Anatomy for Medical Students. 5th ed. Boston, Mass: Little Brown & Co; 1990. 659-61. The authors and editors gratefully acknowledge the contributions of the previous author, M Abraham Kuriakose, MD, to the development and writing of this article.